This past weekend came and went in a flash, and if you didn’t notice the scores of junior freeride athletes terrorizing the Hawk’s Nest and Headwall over the weekend then you were missing out. The bar of possibility was once again raised at CBMR as ski clubs from the western US descended on Crested Butte. CBMST seniors Brittany Barefield and Emma Patterson went 1st and 2nd, respectively, in their 15-18 ski female division while several of their cohorts earned strong top 10 finishes across the divisions. 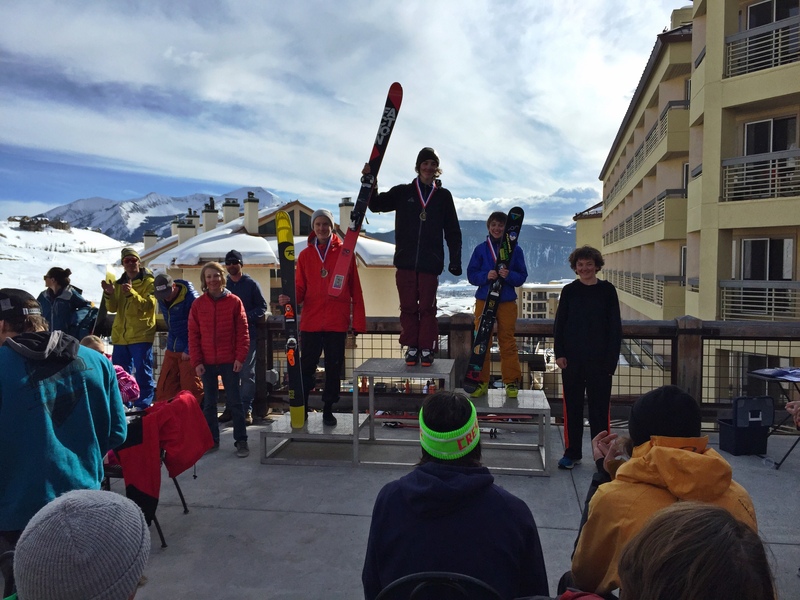 The Jackson Hole Ski and Snowboard Club, Altabird Freeride, and Ski Club Vail, amongst others, made their presence felt on the podiums as well. Peter Hunt earned himself 4th place amongst some ripping skiers. The action kicked off on Friday with all categories save the 15-18 ski and snowboard males on Hawk’s Nest off the North Face Lift. Dagan Schwartz, CB’s sole freeride snowboarder, laid a good one down to claim second going into the finals while Jon Clay Patterson took 4th over on the 12-14 ski side. Carson Hildebrandt laid down one of the most confident runs in that division only to see it slip away as he was bitten by a snow snake as he entered the finish corral. Grant O’Brien was unable to qualify for the finals despite laying down a solid run in only his 2nd competition weekend. Amidst some really consistent skiing in the 15-18 ski females, Emma Patterson and Brittany Barefield found themselves in 4th and 6th, respectively, hungry for redemption on Headwall and only 1.3 points out from first. On Saturday, the 15-18 ski male division was something to watch on Hawk’s Nest. Vail standout, Kevin Nichols, set the tone when he sent it 30 feet out from the cliffs in Old Pro early in the day to a harshly-judged wheelie stomp that made the cut. The CBMST contingent was not to be outdone when Peter Hunt laid down one of the most aesthetically-pleasing runs of the day, making the Hawk’s Nest/Old Pro bumps looks like a groomer, earning 4th. Patrick Curvin was not far behind in 7th. Oz Scott threw one down in the top 20 with an “oh snap” moment when the same snow snake that got Carson tried to take Oz down and Conrad Truettner was able to qualify for finals as the only telemarker. Unfortunately, an errant pole plant tripped up Lane Griffin enough to push him out of the finals; Matthew Harper-Johnston and Alden Watkins laid down great runs that simply weren’t enough in the 70-strong 15-18 ski male field. Noah Buehler was self-eliminated with the only true CBMST crash of the day in what was developing into a charging run in his 2nd competition. Jackson Hole Ski & Snowboard Club represented when Christopher Mayers rode the line between OC (Out of Control) and sweetness amidst a bunch of skiers from Altabird and Jackson Hole in the top 10. Jon Clay Patterson found himself in 4th in the new man-boy division, 12-14 Ski. The venerable and legendary Headwall showcased the finals on a bluebird Sunday. 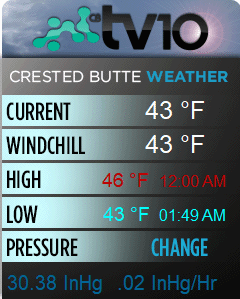 The highly-touted 45″ that CBMR received earlier last week had set Headwall up as great venue once again. And as usual, good conditions can make for punchy landings and spectacular crashes in soft snow. Thankfully, no athletes were hurt with the crash rate hovering around 50% among the faster 12-14 male Ski and both 15-18 male and female ski divisions. Moves were being made and among the 8 CBMST athletes in the finals, 6 athletes moved up or retained a top 10 position. Dagan Schwartz took the victory in the 12-14 snowboard Male division and local standout, Avery Bernholtz, was able to move up to 3rd from 5th in the 12-14 ski female division behind a couple of Ski Club Vail girls, Austin Obourn and Alexandra Carey. Jon Clay Patterson repeated his 4th place with a solid air off of Box Rock behind Altabird’s Aiden Pruett and Louis Overington in 1st and 2nd, and Ski Club Vail’s Finn Andersson in 3rd. The CBMST 15-18 ski females were out to make the podium with Brittany Barefield and Emma Patterson both being the only ladies to successfully ski the Angle Gully in their division. Emma Patterson found herself in 2nd, 2.5 points ahead of her closest competition on the day and Brittany Barefield came from behind to take the victory a full 2.25 points ahead of Emma. Local judge, Tom Runcie, noted, “Brittany would have been top-10 amongst the 15-18 Ski Males with the way she attacked the fall line in Angle.” Rae Lemmon, a converted racer from the Winter Park Big Mountain Team took 3rd overall with Sydney Ricketts of Altabird Freeride and Eliza Donahue of Taos Freeride in 4th and 5th, respectively. 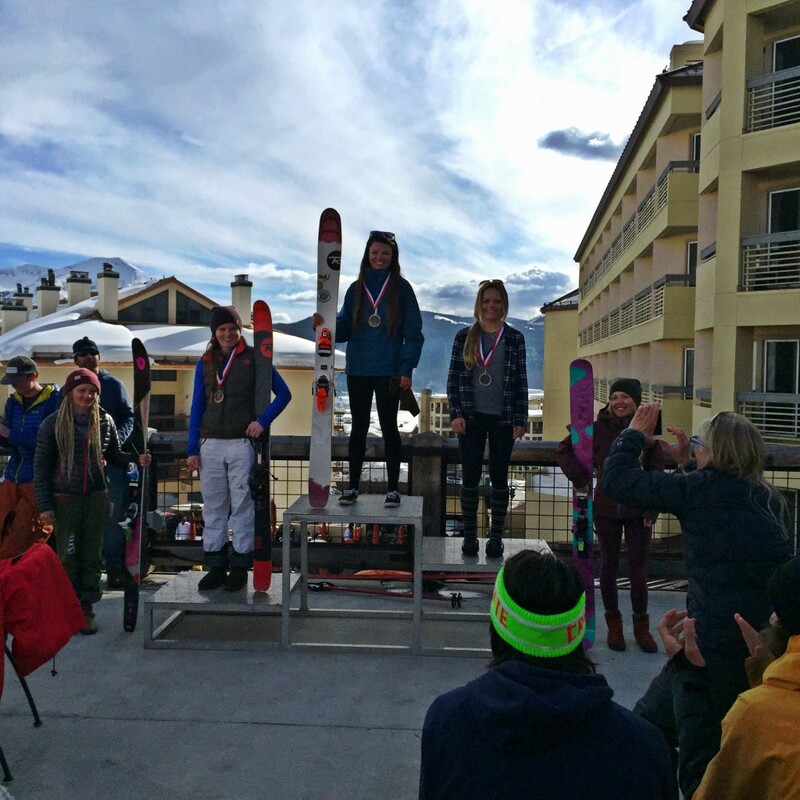 Brittany Barefield and Emma Patterson delivered the 1-2 punch in the 15-18 ski females. Finally, in the 15-18 ski male division, CBMST’s Patrick Curvin and Peter Hunt were left to defend Headwall after untimely falls from Oz Scott and Conrad Truettner. Patrick’s greasing of the Diving Board out of Angle was good enough to move him up to 6th while Peter Hunt’s sending of Box Rock and ensuing 2 Super-G turns down Headwall kept him comfortably in 4th. The aforementioned Christopher Mayers of Jackson, WY was the only athlete who linked Angle Gully and the Handrail, moving up to 1st place from 6th after some crashes from higher-placed athletes helped everyone out. 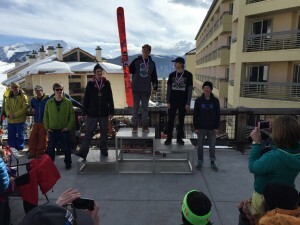 He was half a point ahead of his Jackson Hole Ski and Snowboard club teammate, Ben Schulz, in 2nd, and Jack Nichols of Ski Club Vail in 3rd, with another Jackson Hole teammate, Jack Fenn, in between Peter Hunt and Patrick Curvin in 5th. The rest of the top 10 showed Grifen Moller of Team Summit in 7th, Nicholas Goralka of Aspen Valley Ski & Snowboard Club in 8th, Ryan Tagawa of Winter Park Big Mountain Team in 9th, and Connar Paller from Altabird Freeride in 10th. These athletes are a pleasure to watch on classic venues like Headwall and the classic-in-the-making, Hawk’s Nest. A big shout-out goes to all the volunteers, the CBMR Event crew, and the CBMR Ski Patrol for making the event a great success during this low snowfall and high temperature year. Up next in the IFSA calendar is a Vail double regional, and the coinciding Grand Targhee National and Breckenridge Regional event weekend following that.